That being said, the guys at power commander were immensely helpful. I figured out the ignition issues, as well as how to tune it. There's still a handful of sensors I am going to have to going to have to trick the ecu as reading as ok, but one thing at a time. I will need to buy a few of their products to make life a littler easier. Their autotune system will be a huge help for sure. This torsion bar setup is funky man. Anyone know if once the bolt on the side is removed if you just tap out the bar? I've also read some people stating remove the valves first, others says after. Nothing like conflicting information. Oh, and picked up a tank off ebay. Needs a little love but almost rust free. Just tap the bar out once you remove the side bolts. There is not that much tension there. I've rebuilt the CB450 about 3 times, and it gets easier by the third time and I always learn something or an easier way to do things on these bikes. Seriously though, any questions I have I won't hesitate to ask. When I look at this head, it's like the knowledge of engine work I have learn goes right out the window lol. Some of the best improvements I did on my cylinder head was to send it out to get upgraded valve guides so that I could use modern valve seals. There is a guy on eBay from Oregon who performs the work for you if you send him your head, he will also do a 3 angle valve job and can resurface your cam if need be. I had all this done to mine since I already had invested too much on my motor to not do this upgrade. Flugtechnik and I have made some of the same mistakes and learned from them and one another. He's helped me out a lot off line. You got a bunch of good guys here that can help you out of you let them. This place is like a knowledge portal. I was thinking about running the conversion kit with springs, big bore, new cams, and im on the fence about doing the dry clutch with high output oil pump, but im not sure yet. I have to see how budget unfolds. Ive been talking with team hasen honda, and im really interested in the products they offer, particularly their pistons. I guess it depends on your budget up front and your bottom line. It helps to have an end goal in mind also. This way you don't do things twice and spend twice as much. On my 350f i didnt go nuts and the money pit was still deep lol. 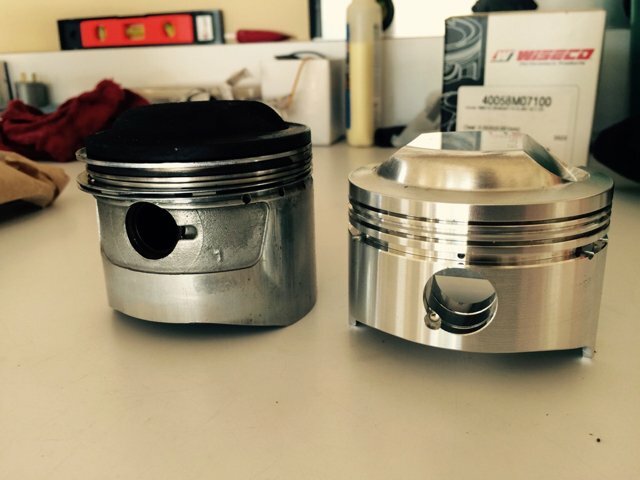 Yeah i saw those pistons, im looking at 11.5 :1 compression. Gonna be fun to kick over!